The second in a series of ten interviews with women scientists across India. Anuradha Lohia has served as Vice Chancellor of Presidency University since 2014. 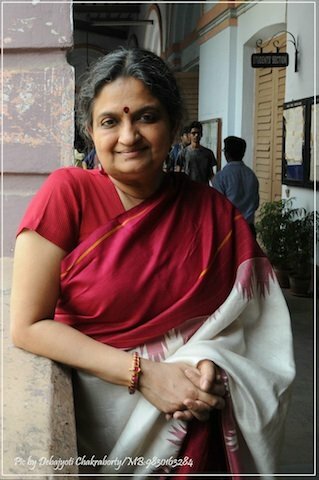 Founding CEO of the Wellcome Trust/DBT India Alliance, her eyes are still brightest when she speaks of the everyday thrills of her work as a molecular parasitologist. We sit sheltered from the monsoon heat of Kolkata in her office as she speaks thoughtfully and with passion about the curious modes of cell division in Entamoeba histolytica, and what it means to be a woman in science. Nobody. I just knew I wanted to do biology. And why did I want to do biology? Biology and chemistry were the two subjects I really enjoyed in school, and then I started to study biology in college, and just continued with biology till my Masters. By the time I finished my Masters I knew that I wanted to do research. At that time the way that biology was taught was quite superficial, in the sense that you learnt about taxonomy and you learnt about Mendelian genetics but you didn’t really learn about the cell. I think that lack of learning incited a curiosity which drove me to ask. So it’s really something that the subject and me had in conversation with each other. It wasn’t a person. The subject was absolutely outstandingly fantastic. I come from a very different family, where there weren’t many academics. Only my mother was a social worker, and that too in the field of education for special children. I didn’t have any inspiration per se either from friends or from family, or an outside person who I’d read about that was fascinating. No. I just did it from a very primal desire to study biology. What is the most exciting research you have been involved in? The most exciting research is what I’ve done for the last twenty years, trying to understand how entamoeba cells divide. What I’ve worked on is a protozoan parasite that causes disease in humans under specific conditions. I wasn’t interested in the disease per se, but how these cells multiplied. When I first started working on it, cell division was on everybody’s lips. A lot of work was coming out in yeast and humans about cell division. People could use genetic engineering to show that cell division was a progression of highly regulated events. If something went wrong at one stage either the cells stopped dividing or turned cancerous. Entamoeba broke all rules. I could not observe that there were the same checkpoints or the same arrests or the same stages as in other eukaryotes. This was very puzzling, very frustrating, because you couldn’t do genetics or mutational analysis in entamoeba. It was very difficult to handle in the lab. So we had to devise our own methods to study the organism. Entamoeba is a parasite, so it knows how to survive under the most hostile conditions. It has the ability to change itself according to its milieu. We discovered that its genome could amplify itself a thousand times, and shrink itself a thousand times. It had different modes of cell division—for example, it used helper cells for midwife-assisted cell division. It also had independent cell division, where two parts of the cell could break off into equal or unequal halves, and nuclear partitioning could be equal or unequal. We found multipolar spindles in a fraction of the cells. At the same time, the same population could have standard bipolar separation. There were fan-like spindles, which could have lateral division. It was amazing. Entamoeba has completely kept me on my toes, morning to night, for the last twenty-five years. Never a dull moment. It would change itself just when I thought I’d got it. It has been fascinating – a lovely journey. I think I’ve probably been able to scratch the tip of the iceberg and say it isn’t like the model systems. It has its own sense. Who have been your women role models – not necessarily in science? My biggest role model was my mom. When I was born, we lived in a joint family where no woman had studied beyond class six or seven. My mother finished her PhD after I was born. This was by sheer grit and determination, because not only did she have to change the mindset of the family, she had to still fulfil the requirements of doing a PhD, which we know are very harsh. And she never gave up her duties at the domestic front. We came from humble beginnings, so it wasn’t that there was a lot of support staff, or that there were other people helping my mother. She would do this and that, and I grew up thinking this is normal. I never thought she was doing anything special. It was only when I did my PhD and I found the crunch very strong that I realised it’s very hard to maintain this. She was an amazing role model—is an amazing role model. My mother still manages at eighty plus to run an institute for mentally handicapped children, which she set up herself, forty years ago. My only dream at one point of time was not to fall short of what she’s done. I don’t know if I’ve achieved it or not, but at least I’ve tried. Another role model is my daughter, in a very reverse way. She was born while I was doing my PhD. Without her demanding it or saying anything, I knew I would have to become that [same] role model for her. How difficult has it been for you to achieve a sustainable work-life balance? How can institutions help in this regard? I think I was lucky because I grew up knowing that a work-life balance is very difficult. And I also knew I had no option but to have a work-life balance. It was ingrained in me as a child that both would go in parallel. For me, yes it was sustainable. Even when the going got rough, I managed. Sometimes one would take priority over the other—but it’s not something I thought about. I just did it. I feel that the help given by institutions should not be crippling. It should not make women feel that they can’t do something on their own. Help should be given only when someone is really struggling. But yes, institutions can make it easier by having a creche for the child, or having flexible working hours. In the research institutions that I went to, flexible working hours were a given. So I really didn’t have an issue with that. In my case, I don’t think a creche would have helped because I lived my life in a joint family. But there are nuclear families where the woman is looking after her child alone. There, a creche is essential. It would allow the woman to work for much longer. Do you think women need to be mentored differently? Do young women benefit from older women mentors? I have benefited from mentoring, and tried to give it to my students and my daughter. And anyone else who asks for it. I’m happy to give it to them. Do you think sexual harassment is an issue in Indian academia? How would you help a young women scientist in such a situation? I have never faced it, but I do think sexual harassment is an issue in Indian academia. I have always been part of the women’s cell in my institute, and I have made sure that women who have been harassed have got justice. The problem often is that the women themselves get so nervous they withdraw their complaints. They don’t give it in writing. So then I go in as a mentor and tell them there’s nothing to be scared of. Anyone being part of a sexual harassment cell must also be a part time counsellor, or arrange for counselling. Women tend to believe other people about themselves. If anyone tells a woman, “Look, you won’t be able to do this,” this woman carries it in her subconscious, goes home and says, “I know I won’t be able to do it.” She doesn’t know it from herself. She knows it because half the world has told it to her. This is where mentoring and counselling go hand in hand. What are the structural roadblocks that impede progress of women in science? Family. The time that you start wanting to have a family is also the time when you have to build your career. The biological clock will tick, and stop. But if the career path could be extended so that the slope of the curve is not steepest at the same time as the family period, it would change things. So if I could get into my productive phase once my children have been born and got into school, and then focus on this, it would be easier. For women, promotion schemes could be skewed if they’re of childbearing age. If they don’t have to follow the same promotion policies, I think women would do much better. And not just women – the entire work force would then do better, because you’d have more productive people, and women would not fall by the wayside. Have things become better since you started your career? In what respects? In every way. Society, people in the workplace – more and more women have come into the work force, and they realize how strong a force it is. And there’s much more money out there for research. You don’t have to fight as much as we did when we started our careers. Also, women being in the workplace for sustainable periods of time has changed the mindset ever so slightly—but even that ever so slightly is a lot. I think it has definitely become better, and I can only see it becoming better and better. What is one change that, in your opinion, would hugely benefit aspiring women scientists? Think confident. Every single woman must know that she is wonderful, that she is good, and that she doesn’t need anyone else to tell her that. And anyone else who says anything less than that is a liar. One advice I did get was when the director of my institute in which I was doing my PhD said, “You must go for a postdoc.” I had assumed that after having a small child during my PhD, I would not be able to go for a postdoc. I was living in a conservative joint family, and the family was a business family. I never thought I would have a career as a scientist by going to the USA or elsewhere. I just thought I’d continue to do my science in whatever lab I am in. Once that decision [to go abroad for a postdoc] was taken, family fell into place. People resisted, people criticized. I ignored them. It takes a lot, but I did it. And I’m very happy I did, because it made a difference. Not just to myself – to my daughter, to many friends and to many women. And to many men who had to start thinking that their wives are their equals, or more. And that I’m proud of.